From left to right: Ricky Mathews, Grace Thomson, Vance Lehmkuhl, Hannah Allam, Dan Auxter, Pat Royal, Dave Bauer, Devon Goetz, Warren Blankenburg, Andrea Mathewson, Tom Lasseter, Mary Ann Lindley, Dennis Wichterman, Trisha O'Connor and Don Olmstead. 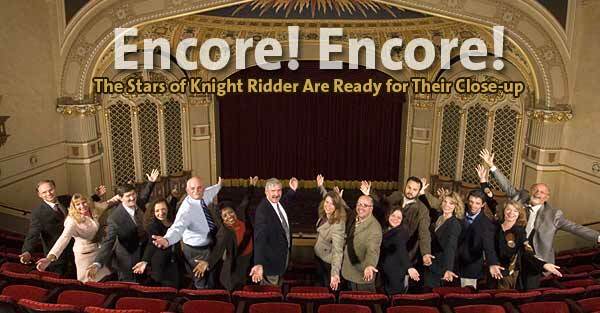 Each year, Knight Ridder honors individuals from throughout the company for their outstanding performance and their ability to inspire excellence in others. Employees are nominated by their newspaper or company. Winners receive a cash prize, stock options and a trophy, and are invited to an awards dinner with Knight Ridder’s Board of Directors and officers. A 10-member judging panel led by Joan Ridder Challinor, member of the U.S. National Commission on Libraries and Information Science and a retired Knight Ridder Board member, selected the winners. Other panel members were Ken Bunting, executive editor, Seattle Post-Intelligencer; Don E. Carter, retired vice president, Knight Ridder; Dr. Virginia Dodge Fielder, retired vice president, Knight Ridder; Larry Jinks, retired senior vice president, Knight Ridder, and retired publisher, San Jose Mercury News; Steve Montiel, director, Institute for Justice and Journalism, Annenberg School for Communication, University of Southern California; Linda O’Bryon, senior vice president, Nightly Business Report/WPBT; Orage Quarles, publisher, The (Raleigh) News & Observer; Chris Urban, president, Urban & Associates; and Bill Winter, president, William Winter and Associates. When John S. Knight died in 1981, he left behind a newspaper empire that had grown from his father’s Akron Beacon Journal into a national company that merged with Ridder Publications to form Knight Ridder. He left much more. John S. Knight was known throughout the newspaper industry as a journalistic giant. A shrewd businessman, he was also a writer’s journalist who won a Pulitzer Prize for The Editor’s Notebook, a column he wrote for almost 40 years. It is for John S. Knight, and all that he stood for, that Knight Ridder’s highest Excellence Award is named. The James K. Batten Knight Ridder Excellence Awards are named for the man who created them in 1987, former Chairman and CEO Jim Batten. Batten emphasized the need for employees – and the company – to be able to change with the demands of a fast-changing world, and to strive to exceed customers’ expectations. And he wanted to salute employees for things they had done to bring honor to themselves and the company.